Listen to Samples & Purchase. 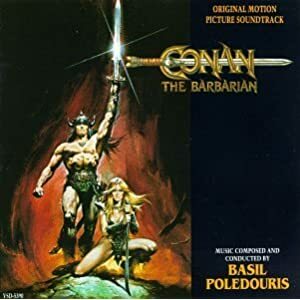 Basil Poledouris’s wonderful orchestraed score featuring wordless vocals is a staple for any typical fantasy campaign. It has themes for love, battle, towns, magic, suspense, and more. My recommendation, get it and get to know it because it is a great fall back for whenever you are put on the spot for a scene you hadn’t prepare and need music quick. This has it all and you’ll never get sick of it. Some of my favorite tracks are “Theology/Civilization”, “Tree of Woe”, and the opening theme “Anvil of Crom”. I have to agree with DM on this one, this is a great album for use in any fantasy campaign. The tracks just ooze with medieval sound.